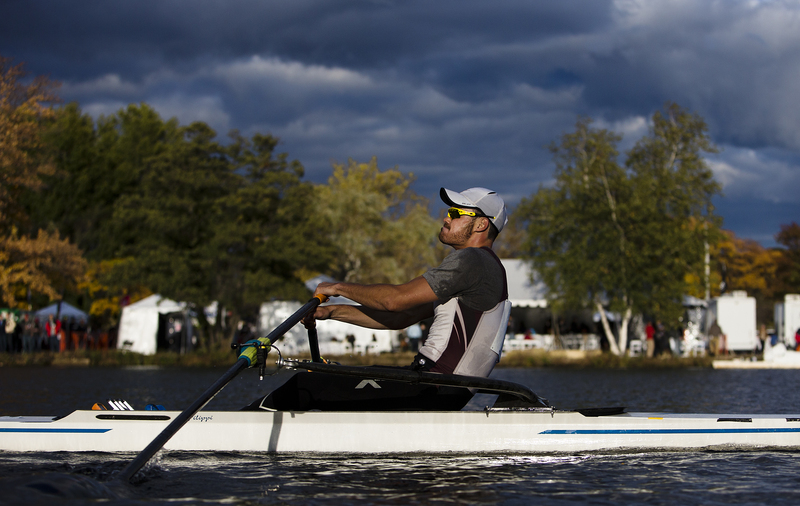 Robert Meenk bow number 14 and Sam Hausmann bow number 16 race past Cambridge Boat Club in the Men’s Lightweight Singles event at the Head of the Charles rowing regatta in Boston, Massachusetts on October 18th 2015. 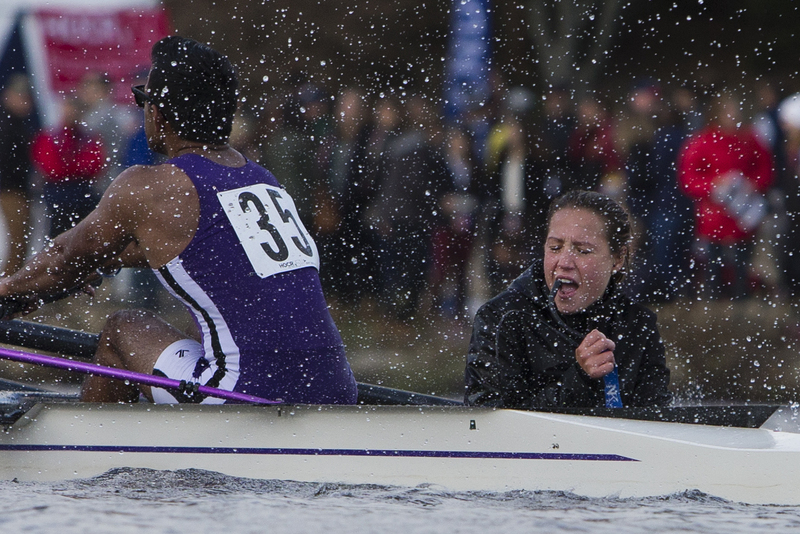 Coxswain Gianna Radelji yells into her microphone as she gets sprayed by her Belmont Hill teammate Szu-raj Kothari while rounding the final bend past the Winsor Boathouse in the Men’s Collegiate Fours event at the Head of the Charles rowing regatta in Boston, Massachusetts on October 17th 2015. 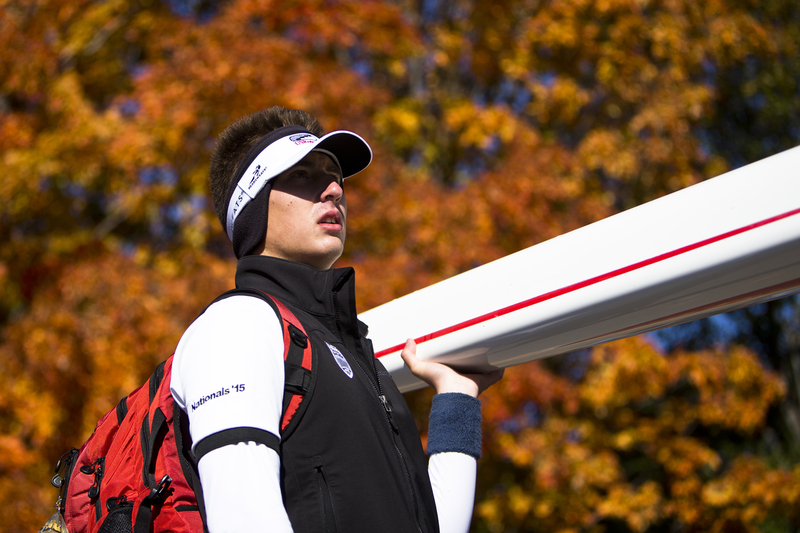 A male rower holds the stern of his boat at the Head of the Charles rowing regatta in Boston, Massachusetts on October 18th 2015. 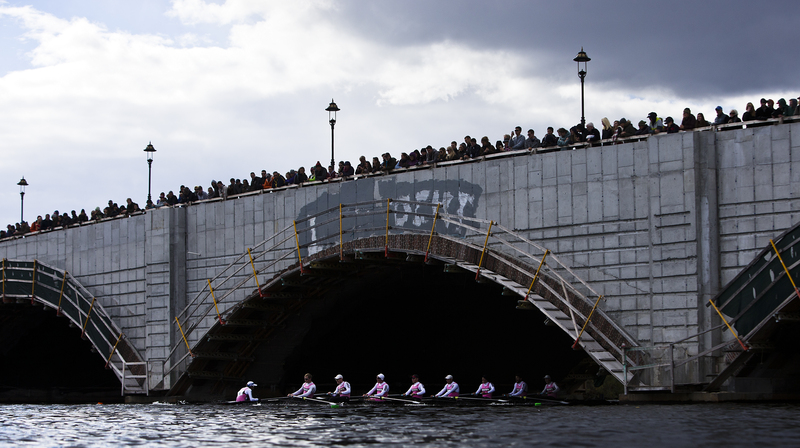 New Canaan Crew, Belmont Hill, CRC/PBC/PENNAC and All-American crews row toward Weld Boathouse after passing under Weeks Footbridge in the Directors’ Challenge Men’s Quads event at the Head of the Charles rowing regatta in Boston, Massachusetts on October 18th 2015. 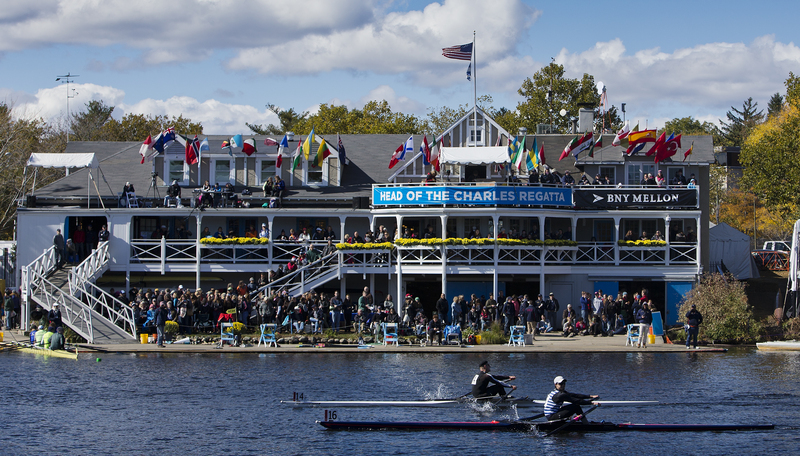 Leonard Futterman of Vesper Boat Club sculls past Hospitality Row in the Men’s Championship Singles at the Head of the Charles rowing regatta in Boston, Massachusetts on October 17th 2015. 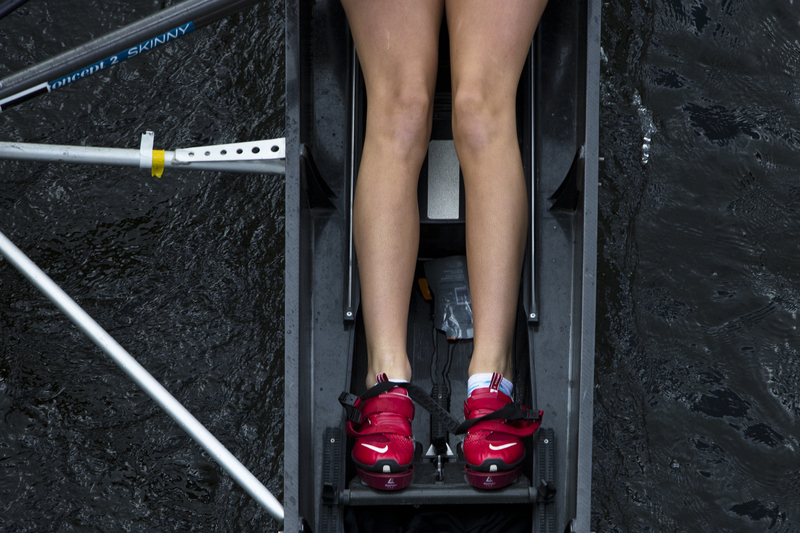 A women leans over Weeks footbridge cheering for her father racing in the Directors’ Challenge Men’s Quad event at the Head of the Charles rowing regatta in Boston, Massachusetts on October 18th 2015. 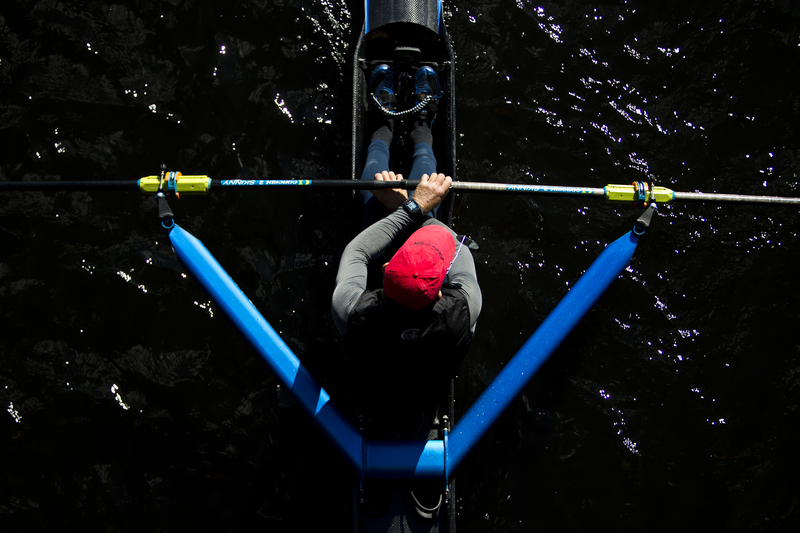 A single sculler goes for a practice row pro to the Head of the Charles rowing regatta in Boston, Massachusetts on October 16th 2015. 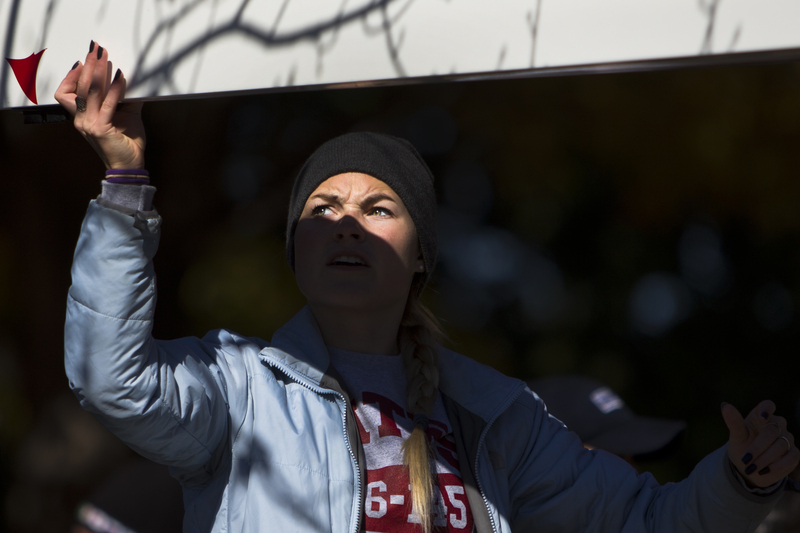 Bates Mens Rowing Team coxswain Marit Wettstein directs the boat back onto the trailer following their race in the Men’s Collegiate Eights event at the Head of the Charles rowing regatta in Boston, Massachusetts on October 18th 2015. The Harvard women’s lightweight crew walks their boat into the boathouse following a training row the day before the start of the Head of the Charles rowing regatta in Boston, Massachusetts on October 16th 2015. 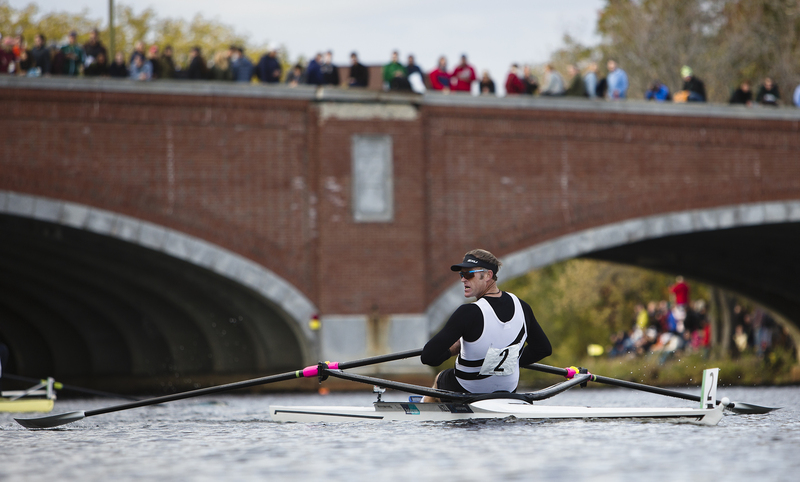 Mahe Drysdale of West End rowing club in New Zealand looks over his left shoulder in the Men’s Championship Singles event after passing under Eliot Bridge at the Head of the Charles rowing regatta in Boston, Massachusetts on October 17th 2015. 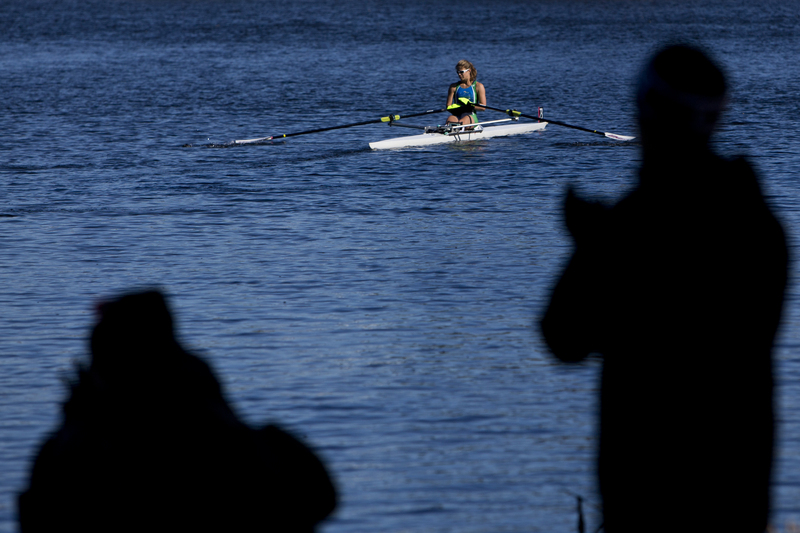 Sandra San Emeterio of Riverfront Recapture rowing club rows to the start of the Women’s lightweight single event at the Head of the Charles rowing regatta in Boston Massachusetts on October 19th 2015. Whitemarsh Boat Club Coach Joseph Sullivan gives rower Gillian George some final words before pushing them off the dock prior to the Women’s Youth Fours event at the Head of the Charles rowing regatta in Boston, Massachusetts on October 19th 2015. 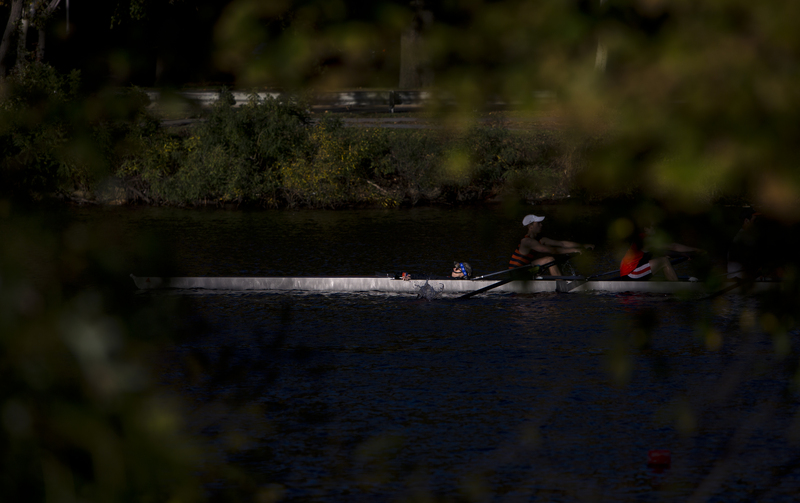 Genevra Stone of Cambridge rowing club looks over her shoulder in the Women’s Championship Singles event at the final turn of the Head of the Charles rowing regatta in Boston, Massachusetts on October 19th 2015. 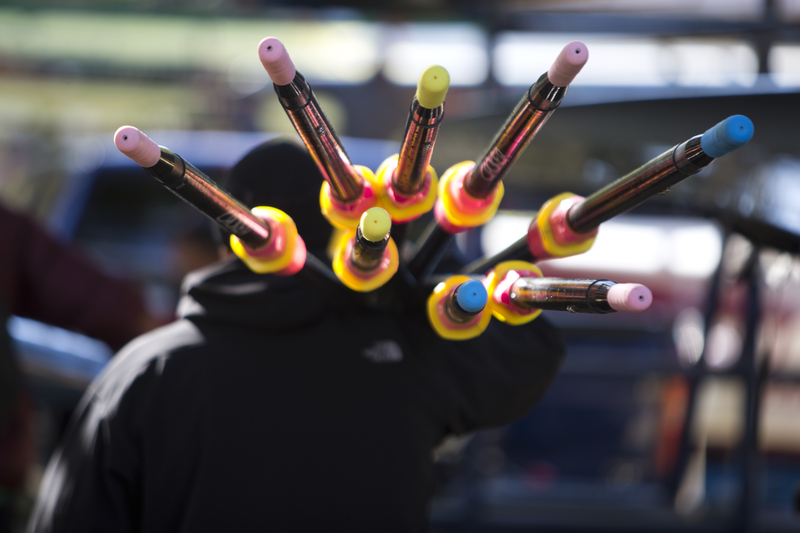 A coach carries Croaker rowing oars back to the trailer during the final day of racing at the Head of the Charles rowing regatta in Boston Massachusetts on October 19th 2015. Franklin Pierce coxswain Arielle Landaeta steers her crew of Krystin Bernacki, Ella Scott, Karin Rozelsky and Samantha Pomer around the final turn in the Women’s Collegiate Fours event at the Head of the Charles rowing regatta in Boston, Massachusetts on October 17th 2015. 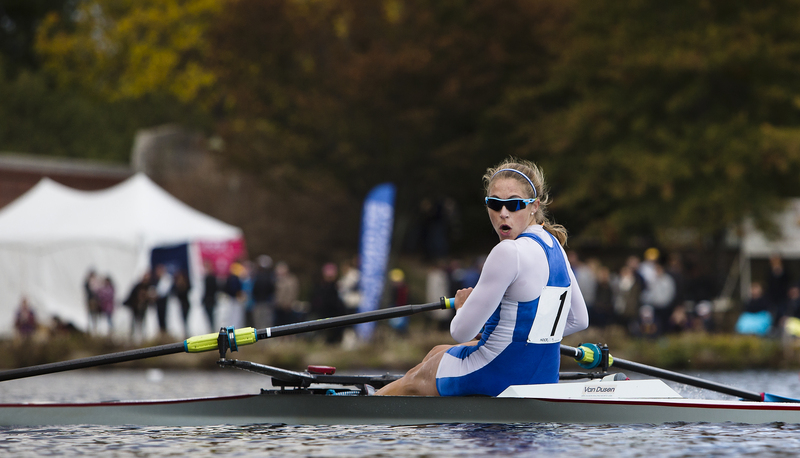 Katie King-Smith of Headington crews pushed her legs down in the Women’s Youth Eights event at the Head of the Charles rowing regatta in Boston Massachusetts on October 18th 2015. Mass. 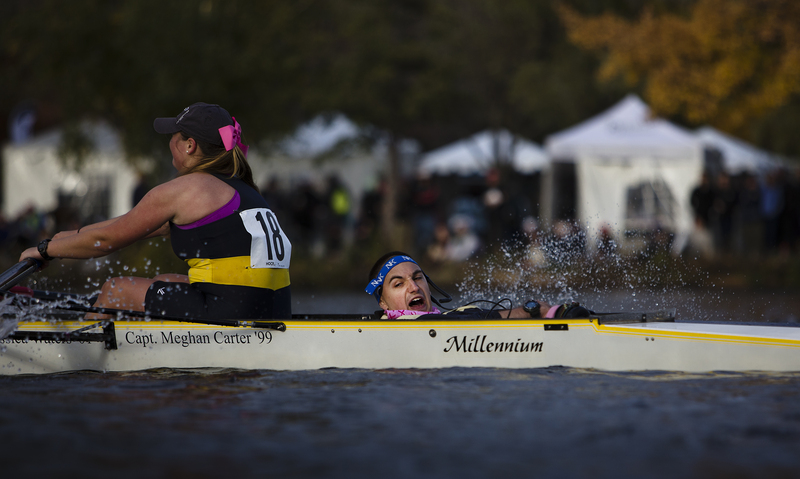 Maritime coxswain James Lucenta yells instructions to bowseat Laura Hahn as he completes the final turn around Eliot Bridge in the Women’s Collegiate Fours event at the Head of the Charles rowing regatta in Boston Massachusetts on October 17th 2015. 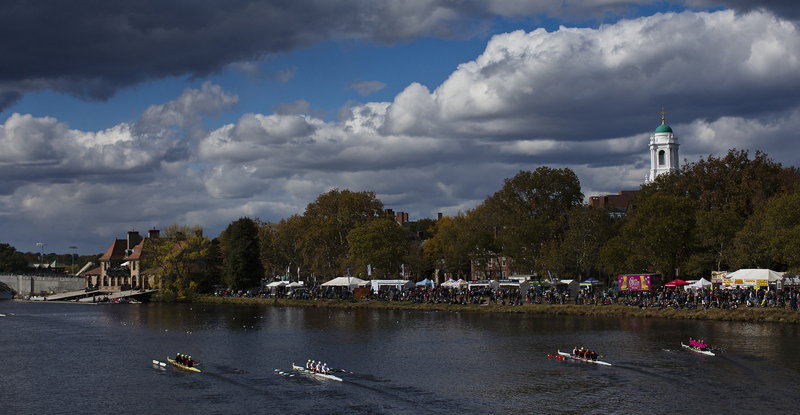 Crews complete a training session the day before the start of the Head of the Charles rowing regatta in Boston, Massachusetts on October 16th 2015. 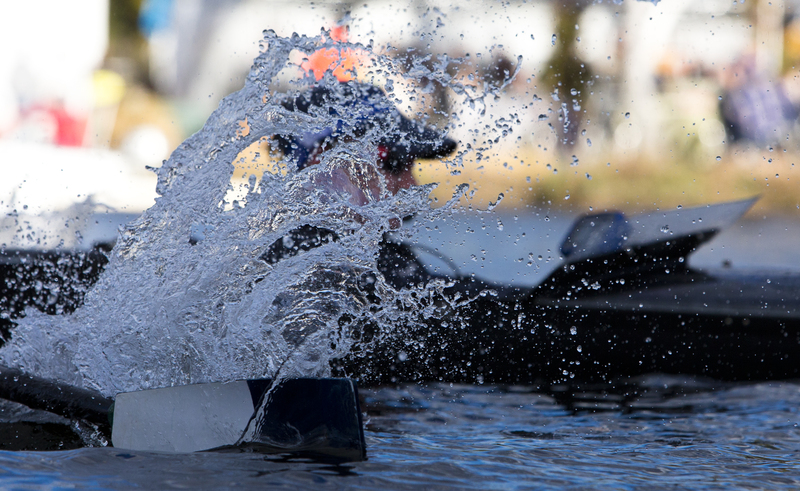 Marietta College’s coxswain Patrick Specht gets splashed by bowman Ethan Schafhausen as he completes the final turn around Eliot Bridge in the Men’s Collegiate Fours event at the Head of the Charles rowing regatta in Boston Massachusetts on October 17th 2015. 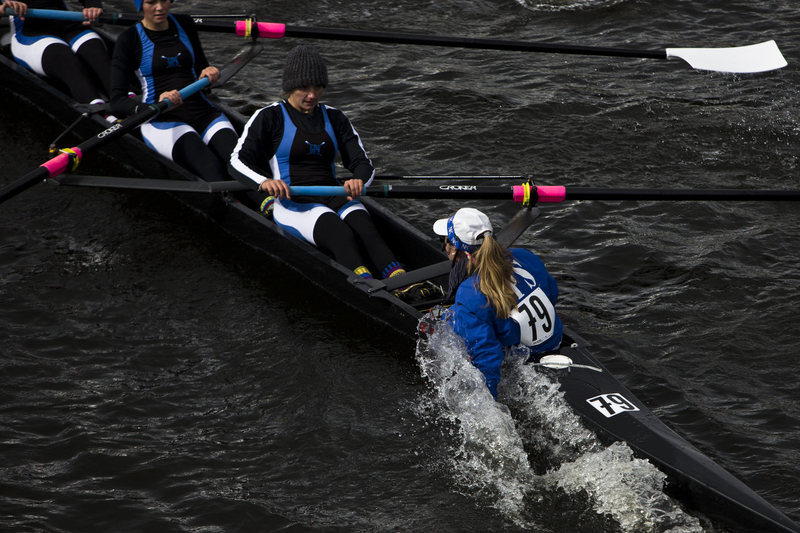 Coxswain Sarah Brown pushes her left arm into the water attempting to turn her McCallie Women’s Youth Eights crew around Weeks Footbridge at the Head of the Charles rowing regatta in Boston Massachusetts on October 18th 2015. 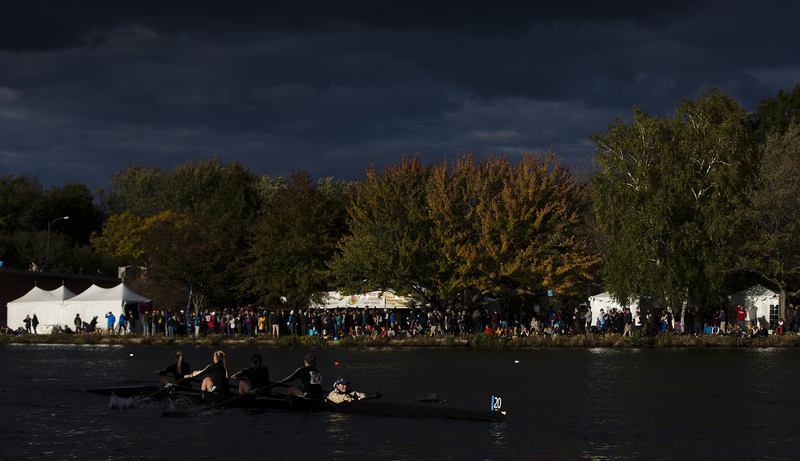 A coxed four goes for a training row the day before the start of the Head of the Charles rowing regatta in Boston, Massachusetts on October 16th 2015. 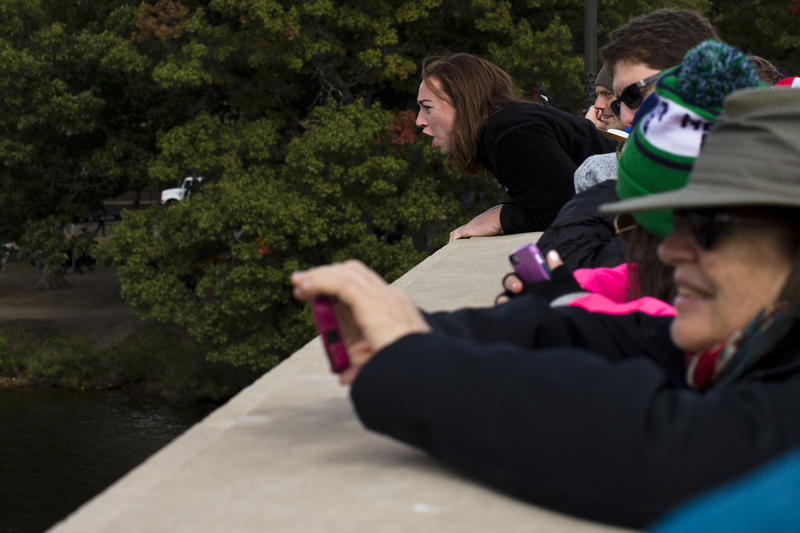 The Brown University men’s eight , cox Neil McKenzie, bow Peter Woolley, Anand Rajesh, Viggo Hoite, Gregory Bitler, Brooks Reavill, Albert Caputo, Thomas Meeks and stroke Avery Reavill row as spectators watch from the top of Anderson Bridge during the Men’s Championship Eights event at the Head of the Charles rowing regatta in Boston Massachusetts on October 18th 2015. 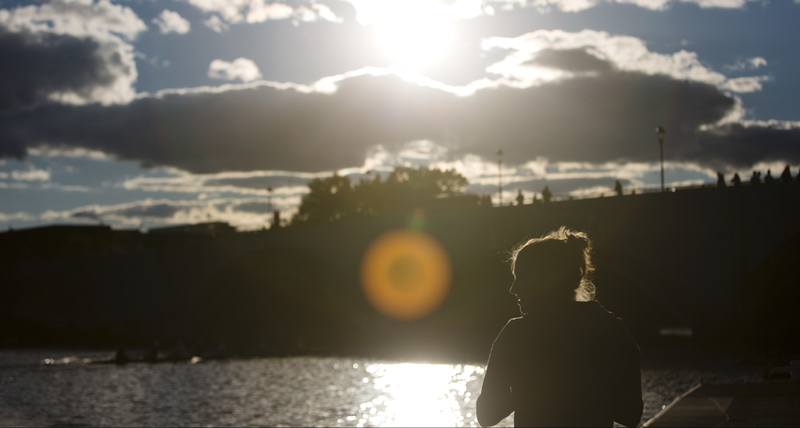 Sofia Donnecke, member of the Harvard Women’s rowing team stands on the dock of Weld Boathouse taking a photo crews rowing along the river the day before the start of the Head of the Charles rowing regatta in Boston Massachusetts on October 16th 2015.